The race began on Saturday, August 11, 1979. 303 yachts and 2,700 sailors set out on the 608-mile race from the Isle of Wight. The course took the yachts westwards across the Irish Sea, around the Fastnet Rock 3 miles West of Cape Clear and back. The race began in fine weather with no warning of what was to come. Many of the larger yachts were rounding the Fastnet when weather conditions deteriorated rapidly as a Force 10 gale swept across the North Atlantic at an alarming rate. The yachts were pounded by 40-foot breaking waves and rescue helicopters and lifeboats struggled to save them. These conditions endured for 20 hours. Rescue crews pulled 136 sailors from their yachts or the sea, but 15 men died, two of whose bodies were never found. Only 85 boats managed to finish the race, while five sunk and a further 24 were abandoned. One of the few boats to reach the finish line in Plymouth was Morning Cloud skippered by former UK Prime Minister Edward Heath. Three Irish Yachts were competing for the Admirals cup and were in pole position before the last race, of the series, the Fastnet. When Regardless lost her rudder that was the end of the Irish dream. 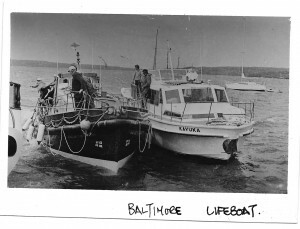 The boat was towed into Baltimore by the lifeboat The Robert. A second Irish yacht Golden Apple of the Sun lost her rudders too, and the boat was abandoned by her crew in favour of a helicopter when another gale was forecast for that night. The third Irish boat Invincible made it across the finishing line. Special regulations were brought in following the disaster to make it mandatory for competing yachts to carry VHF equipment and reduced the total numbers of yachts competing. The 25th anniversary was commemorated in 2004 by a wreath laying ceremony which took place at sea, off North Harbour, Cape Clear Island. Coxswain Kieran Cotter laid the wreath from aboard the L.E. Eimear in the company of Terence Johnson Deputy Chairman, RNLI Ireland, and Commanader Kavanagh of the L.E. Deirdre, the Irish naval ship that took part in the rescue operation. The L.E Grainnuaile stood by during the ceremony and was accompanied by a large flotilla of pleasure craft. Our current Coxswain Kieran Cotter was part of the lifeboat crew that spent over 20 hours at sea onboard the Robert. A commemorative plaque was presented to Kieran and members of the Baltimore Lifeboat. The citation reads; “The heroic work of Coxswain Christy Collins and crew of the Baltimore Lifeboat, The Robert, who rescued the crew of the Regardless and Marionette and towed both yachts to Baltimore is acknowledged as an extraordinary feat of seamanship conducted during the storm in which the 15 Fastnet race competitors perished”. The photo above is dated 15th August 1979 and was taken by Anne Minihane. It shows the Robert back out on duty shortly after the heroic efforts of the previous days. 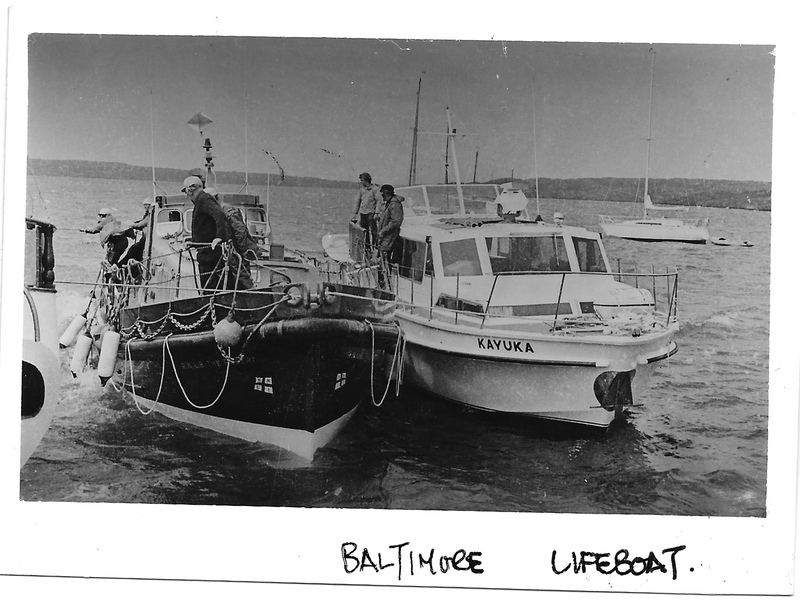 If you have photos of lifeboats stationed at Baltimore we would love to see and share them. Photos can be uploaded through the form on the website contacts page.